Yoga is the preferred form of movement for many people. Meditation might be a luxury for others. However, for the aging community, regular practice of these mindful activities should be taken more seriously. They provide quantifiable benefits for overall senior health. A gentle yoga class can help improve flexibility and circulation while simultaneously reducing heart rate and blood pressure. These are measurable advantages, but there are also innumerable subtle benefits that will be unique to each individual. For some, thought processes and attitudes will become more positive, while others may experience increased tolerance to pain. The best part is that all participants will benefit from improved quality of life. Mindful, intentional movement, has reportedly reduced back pain and stiffness with as little as 33 minutes a day, three days a week. 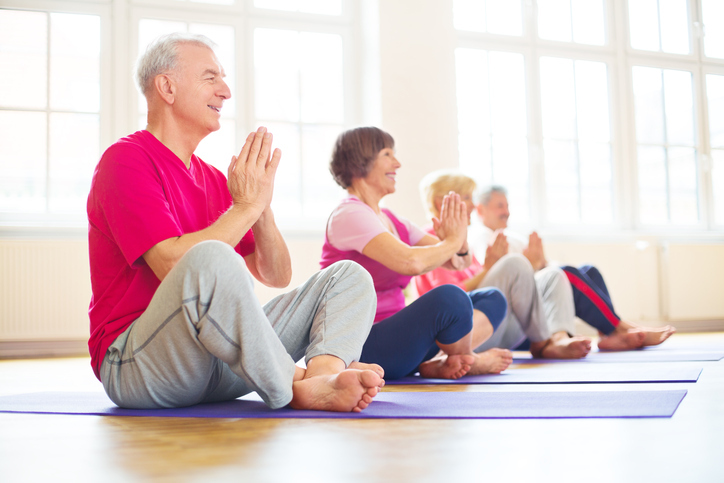 “Yoga and Other Low-Impact Exercise for Seniors,” a blog post published by A Place For Mom, is an excellent resource for further information. It carefully explains the many and varied advantages of a yogic practice, citing research from Harvard Medical School. In addition to physical movement, some practices engage mantra (word repetition) and mudra (hand postures) to create dynamic brain-building exercises. One such exercise, Kirtan Kriya, has been studied extensively due to the remarkable improvements found in practitioners’ brain function. Better recollection, mood improvement, and increased connectivity have been observed in cases incorporating a practice of only 15 minutes a day! Psychology Today notes that this minimal investment pays off exponentially with increased memory recall and verbal acuity. The cumulative benefits of physical yogic exercise and meditative mantra can significantly improve quality of life expectations in the senior community. The aging community often focuses on attempting to reduce the negative effects of time. With yoga and meditation, it is possible to improve and re-energize the body and brain. Yoga is a wonderful option for the aging senior. The best thing about yoga is that you can practice anytime, anywhere. You don’t need a mat to practice yoga just a few minutes a day. Think about yoga as a state of mind, a way of creating an inner peace with yourself and the world. This mindset will help you get the most out of your practice. If you’re a beginner, the AARP has some great information to get you started with basic poses. However, if you find yourself without a mat, you can practice these simple techniques. Meditation is the art of clearing your mind to create a greater awareness and appreciation of the world around you. Practicing mindful meditation as a senior can help you center your thoughts and create an inner calm. Pranayama, also known as yogic breathing, is the practice of breaking down your breath to help you relax. This form of yoga can help lower your heart rate and get more oxygen to your brain. It will also help your muscles relax. Just a few minutes a day of this technique can help you renew your energy for the day. Standing poses allow you to work on your balance, strength, and flexibility. Incorporate a few forward folds, standing backbends and side bends to help you keep your muscles pliable. These poses will also help reinvigorate you. The most wonderful thing about yoga is that it is a personal practice. Make it what you want, take from it what you need. It is a great activity for active seniors as well as those new to exercise. For more information about David York Agency’s qualified, compassionate caregivers, contact us online or by phone at 718.376.7755. A free phone consultation can help you decide how to provide your loved ones with the assistance they need. If you’d like to hear more from us, please like us on Facebook or follow us on Twitter, Google+, or LinkedIn.